In the last days of the 19th century, some Jiu-Jitsu masters emigrated from Japan to other continents, teaching the martial arts as well as taking part in fights and competitions. Mitsuyo Maeda was one such master. Maeda arrived in Brazil in 1915, and settled in Belem do Para, where he met a man named Gastao Gracie. The father of eight children, among them five boys and three girls, Gastao became a Jiu-Jitsu enthusiast and brought his oldest son, Carlos, to learn from the Japanese master. For a naturally frail fifteen-year old Carlos Gracie, Jiu-Jitsu became a method not simply for fighting, but for personal improvement. At nineteen, he moved to Rio de Janeiro with his family and began teaching and fighting. In his travels, Carlos would teach classes, and also proved the efficiency of the art by beating opponents who were physically stronger. In 1925, he returned to Rio and opened the first school, known as the "Academia Gracie de Jiu-Jitsu." 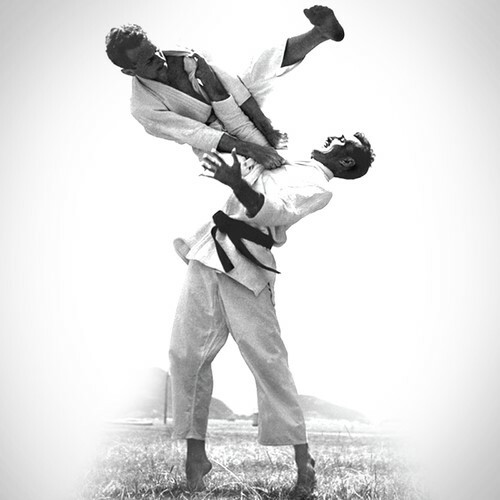 Jiu Jitsu promotes the concept that a smaller, weaker person can successfully defend against a bigger, stronger assailant by using leverage and proper technique.